This is one of my favorite shirts. I regularly wear it to work–in fact, I’ve been wearing it enough that I may need to replace it soon. Working with tech writing, I spend quite a bit of my time assisting in the writing and editing of text for user interfaces, as well as helping colleagues with other types of text. I bought this shirt for fun, but I think it has actually served a purpose as well. 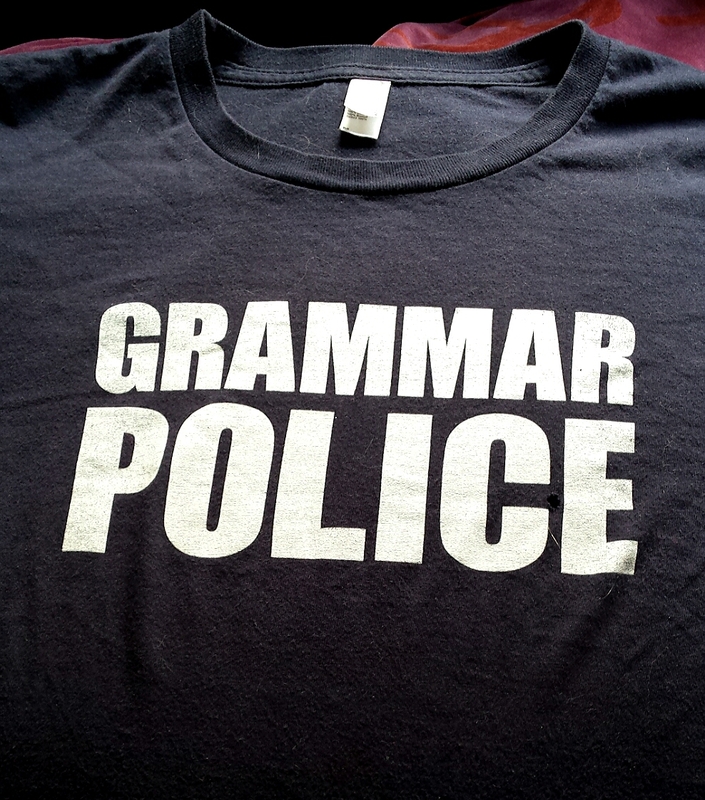 I am getting more “hey, grammar police, can you help me with this” requests from colleagues who are not writers, and I think the shirt has helped make it clear that I don’t mind this aspect of my job–in fact, I rather enjoy it. People realize they are welcome to ask for my help, and that if not, my help may still be … let’s say volunteered. Bought and still available at One Horse Shy.